Once you’ve read my other two posts and have a clear understanding of formative assessment, take a look at these six practical tips you can start using now. 1. Don’t emphasize grading over learning. Your goal should be to help students master the content, not to collect a grade. 2. Create a cooperative, not a competitive, atmosphere. Help your students understand that you are all working together as a team. If someone offers feedback, it is only in an effort to help, not hinder. 3. Focus on quality rather than quantity. Quality work and skill practice do not necessarily have to take long. If your students can show they are mastering a skill or concept through a short task, then move along. 4. Focus the feedback on the task or product, and not on your student. Help all of your students see what they can do to improve their writing. Your feedback should help them feel confident that they can improve and remind them that learning is a process. 5. Keep a list of skills and a record of how your students are doing. * Re-teach the most prevalent ones to your entire class. This will save you valuable time. 6. Know the difference between an error and negligence. A. An error is when students don’t know what to do when an error is pointed out. This requires some additional instruction or re-teaching. B. Negligence is when students know exactly what to do when the mistake is pointed out. This only requires the time to point it out. It does not require additional instruction. 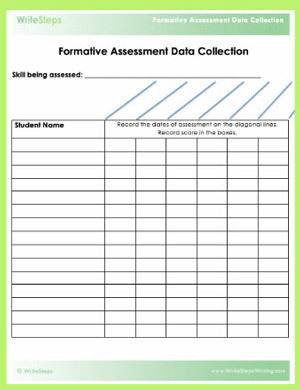 *Our Formative Assessment Data Collection handout helps you keep track of each student’s level of mastery of a particular skill. This record sheet will help you know if additional practice or conferencing is needed for individual students or for the majority of the class. Formal grades should not be given until ample time has been allowed for instruction. Stay tuned for my last (but not least!) formative assessment blog. You’ll receive 5 formative assessment activities you can start using in your classroom.